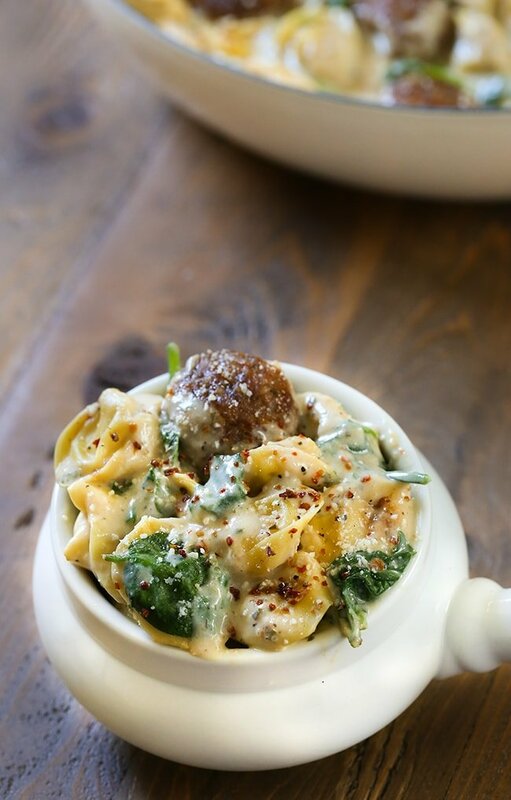 Pan seared garlic with a rich and flavorful creamy onion sauce with spinach, meatballs and tortellini pasta. 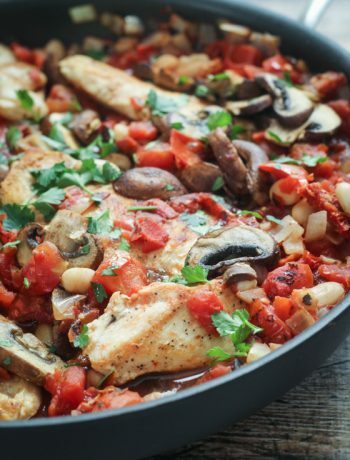 Pan tossed with parmesan cheese and herbs to give a robust Tuscan flavor. A truly simple dish to make for dinner or to serve for a dinner party with a glass of wine. 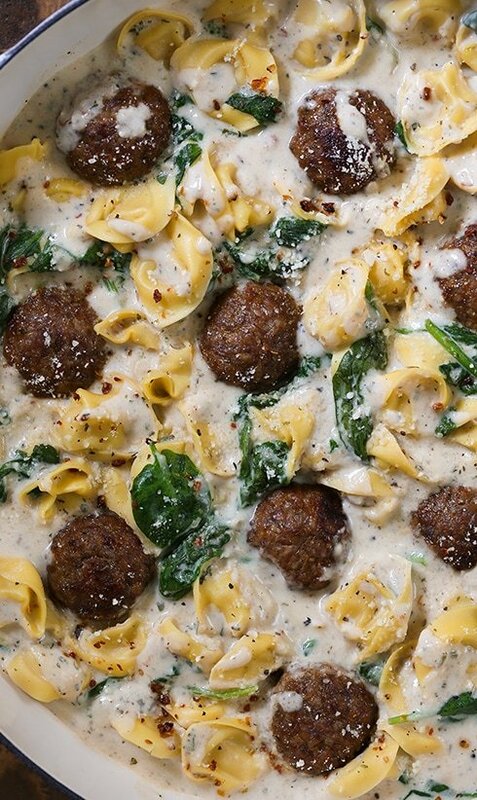 This recipe will become a family favorite. It’s Friday and after a particularly long week of photo shoots and plenty of trips to Starbuck’s for iced coffee lattes, I’m ready to settle into the weekend. Next week, Matt and I will finish editing our first real video for Facebook and Instagram. We’re excited to share this next step and even have a new recipe to feature in it. Saturday morning Hurricane Harvey will make landfall along the coast of Texas. While I’m just a few hours from Houston and yet considered on the coast, we are bracing for lots of rain with flooding. The same kind of flooding we experienced a few weeks ago in New Orleans that left our neighborhood under 3 feet of water. You can read about that here. The city didn’t warn the citizens how bad it was a few weeks ago and so it came as a big surprise when we flooded. Unfortunately, we are facing another flooding situation and during the middle of hurricane season to boot! Thousands of catch basins need to be cleared and pumps need repairs. What makes this an incredibly important storm to monitor is that crucial city pumps are broken and are not performing at max capacity. That’s right. New Orleans doesn’t have a max capacity pumping system available! The pumping system cannot handle severe weather or heavy rainfall due to several pumps and turbines that are out of service. We are expecting 4-10 inches of rain during this time. This has left our city extremely vulnerable. Much like last time, I’m preparing for the power to go out. This includes staying stocked with bottled water and making food that doesn’t need to be refrigerated. I’ll spend Saturday getting furniture and small things off the floor in case of extreme flooding. 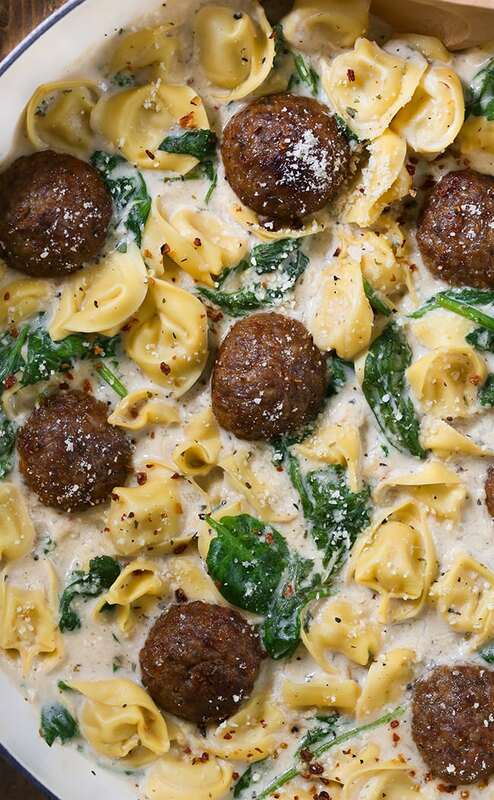 Since the rain bands won’t happen until tomorrow morning, we’ll have plenty of time to finish this Creamy Spinach Tortellini and Meatballs pasta dish. 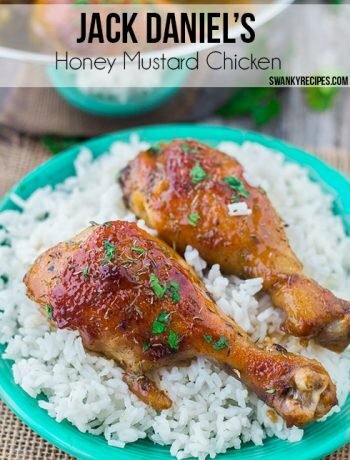 This dish is so easy to prepare. The cream sauce is amazing and tastes just like a toasted onion. Of course, if you can’t find a can of cream of onion soup at the store, you can opt for cream of mushroom or chicken to use as the base. This dish can be made with a variety of vegetables and protein. If you’re feeling adventurous, I like to add diced carrots, sliced zucchini or eggplant. Of course, shredded chicken such as a rotisserie chicken can be used in place of the meatballs. 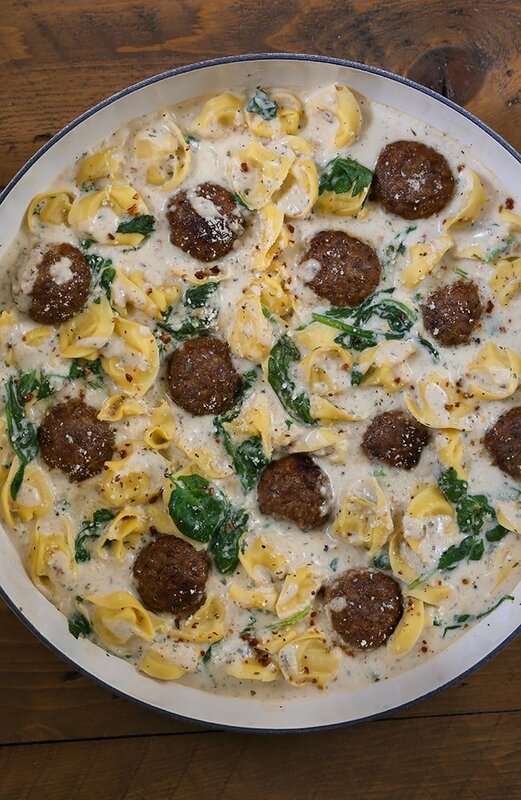 A quick 30-minute pasta dish made with pan seared garlic with a rich and flavorful creamy onion sauce with spinach, meatballs and tortellini pasta. Pan tossed with parmesan cheese and herbs to give a robust Tuscan flavor. A truly simple dish to make for dinner or to serve for a dinner party with a glass of wine. 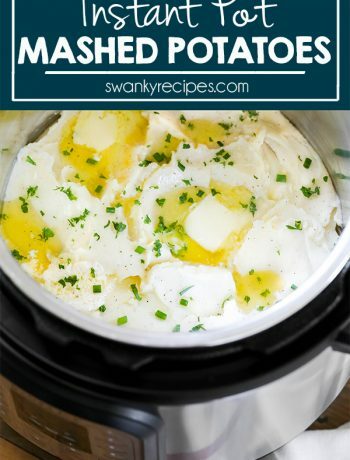 This recipe will become a family favorite. Cook meatballs according to package directions. Drain on paper towel when done. Heat 1/2 tablespoon olive oil (or coconut oil) in large dutch oven or pot over medium heat. Add minced garlic and cook for 3 minutes. Pour in stock and condensed onion soup. Whisk until dissolved. Add parsley, basil, black pepper, Italian seasoning and, red pepper flakes. Stir in 2 cup water and 1 cup half & half. In a small bowl, combine 1/2 cup cold water and flour. Stir to dissolve. Add to pot. Turn stove top to medium-high heat. Cook for 10 minutes, stirring occasionally. Stir in finely grated parmesan cheese. Cook 3 minutes. Add refrigerated cheese tortellini. Cook 3 minutes. Stir in baby spinach. Cook 3 minutes. Shredded chicken can be used in place of meatballs. This dish can be made vegetarian without meat.